“Tramp” said her eyes, sunk into an intolerant, pityless look that contorted her face. “Weirdo” said the face of another, while hastily averting his glance less I ask him for any spare change. “Fisherman” said the welcome smile of a third. She knew her onions, recognised the rod as a tool (not a weapon), recognised the net for what it was, a net. Going fishing in London always draws a pick-n-mix of reactions from the people you share your journey with, and when you’re heading north towards the city, it somehow seems even more incongruous that you might have a fishing rod in your hand, when the bosom of the garden of England is South. What on earth does the city have to offer the angler? It had been a morning from hell. A day booked off from work lost half its weight to the office, so it was nearly 2pm by the time I boarded the train at leafy Nunhead. 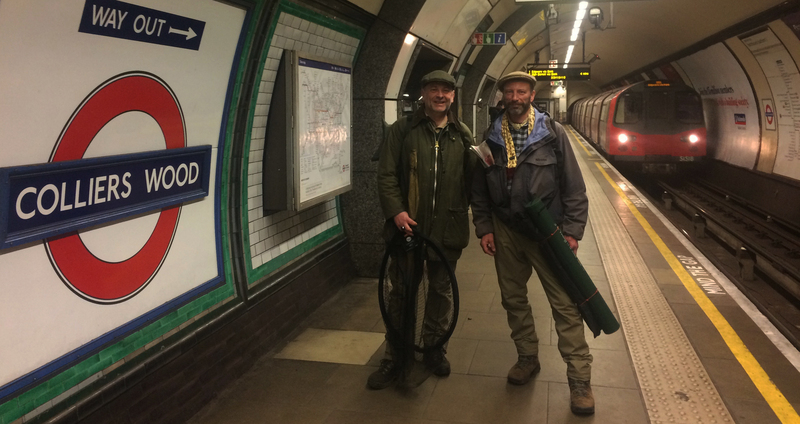 I normally travel to fishing by car, but my mantra this year is to travel light; leave the stress behind, take just what you need, and move around as much as possible on public transport. It also has the added bonus of being able to have a pint or two after a successful day’s fishing. Beer and fishing are happy bedfellows in my book. There’s not many things more satisfying than a pint after a day on the river, and with the end of the river season only a day away, our last chance to cast a line would need to be celebrated. The train took me to Elephant and Castle, from where I disembarked and strode through the dilapidated shopping centre with its eclectic mix of businesses, then down into the cavernous tube, like a worm wriggling for cover from a crow. From there my journey turned south west on the Northern Line, resurfacing into the light at Colliers Wood, where my senses were assaulted by buses, traffic lights, pedestrians galore, honking cars and revving engines, and petrol fumes mingled with the smell of takeaway food. I knew as certain as I knew my name that I was in a city, but the Wandle—reputedly the most fished urban river in the UK—was a mere stone’s throw away. But crucially, furnished with some good advice from the Wandle Piscators and their new book An Angler’s Guide to the River Wandle (available to purchase here) I felt confident of catching at least something. As I paused in the melee and checked my phone for messages, my fishing companions Tony and Nick shouted from the pub across the road. I could not hear them through the traffic but could clearly see them beckoning. They had already fished the river in the morning, gradually working their way to meet me, and over a pint we discussed their findings. I am more familiar with the Wandle than they, but I have only ever fished it once, catching a small trout when I wasn’t targeting it. We were after coarse fish—any coarse fish—but there are barbel in the Wandle, which always adds a certain edge to proceedings. They told me the water was flowing clear and fast, and one had caught an enormous gudgeon. They spoke of fellow anglers sharing stories of roach and chub and big barbel which were always somewhere else on the river, though never where they were. We decided to walk and explore, moving far upriver from the pub, across main roads, past supermarkets and garages, lockups and bridges, quiet corners and manic throngs, casting here and there into any likely spot. With the end of the season so nearly upon us, it was time to use the last of whatever bait was left over, so we trotted with days-old maggots, worms and bread, lost several floats in sunken snags, and eventually settled in a swim where the current pushed fast around a bush, forming a slightly deeper depression in front. We really had no idea where we were. Urban fishing isn’t something I’m used to, but I could get the hang of it. Where immersion in nature and returning to the countryside are part of the attraction of fishing for me, it seems hard at first hand to close the mind to the sounds and smell of the city, but eventually you do, and the river becomes louder and draws your focus away. The sight of a yellow wagtail working its way along the bank made me forget where I was, which is exactly the point. The other aspect is the regularity with which strangers approach you to enquire as to what you’re catching, quite the opposite to my earlier experience on the train. We had several enjoyable conversations with excited children and their parents, keen to know and understand more about angling. To fish in the city can mean putting yourself on the front line. Having lost my favourite float on a snag, I was switching to a ledger when Tony said “Oh, I think I have a decent fish on.” There was no emergency in his tone, uttered as calmly as you’d order a bag of chips. “Really?” we said, believing him to have snagged again. And so he did. The rod had a generous curve, was thumping up and down in the way that it can do when a decent fish is arguing with it, and the rest of us sprang into action with all the panic of last orders at the bar. Then the fish showed on the surface and I exclaimed “Barbel!” The pressure was on. A few minutes later a beautiful barbel—Tony’s first of the species—lay calmly on the unhooking mat. It was not big—between three and four pounds—but that is hardly the point. 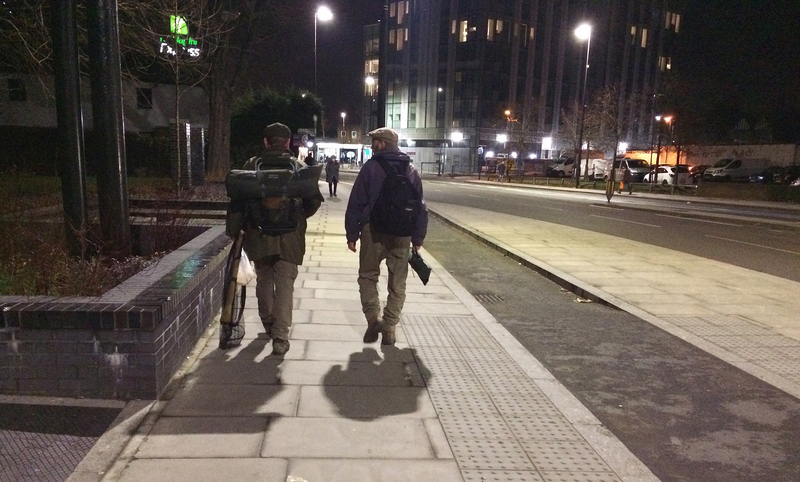 It was an urban barbel, a London barbel, a Wandle barbel, and tempted on a size 14 hook with double red maggot, having been urged on by no more than a handful of loose feed. It was scale-prefect, with a healthily rotund belly, and a wonderful dusting of light gold which changed to bright orange at the fins. It was a chance fish for the roving angler, but it was no fluke. Tony had changed to ledger too to keep the bait from moving too fast in the current, and no sooner had it settled on the bottom than the barbel struck. It was good thinking, good angling, a triumph. The last fish he caught was a near 4lb perch from the river Lea which appeared in the Reader’s Fish column of Fallon’s Angler 12. This was followed by a patience-testing ten blank sessions before his maiden trip to south west London. He had put the time in sure enough, and he deserved it. “Wow,” he said. “That means as much to me as my first salmon.” He was speaking the truth. You could see it in his hands which were still shaking 15 minutes later with excitement. That’s the thing about fishing. We continued to move and to fish, spurred on by the barbel. I caught a small chub to break my blank, my first coarse fish from this charming little river. Then Nick called for the net, and a large, chunky chub, built like a prop forward, was landed, tricked by nothing more complicated than a worm. As darkness fell we headed back along the river to Colliers Wood and that well-deserved pint. The chat was good-natured and excitable and entirely about fish, and we soon adjourned to a nearby restaurant to continue the celebration, while the river flowed not 30 yards away. That’s the things about urban fishing; there’s always some place to eat or to drink and enjoy the connection with your fellow anglers. With the closed season only a day away, that was the end of the year for us. But not so much an end, as a beginning.